Agile manufacturers that can adapt to constantly changing conditions have the competitive advantage. Among the changes currently facing producers are the emergence of the Industrial Internet of Things (IIoT) and Big Data analytics; the proliferation of mobile devices and new “apps” that put more power into the hands of employees anytime, anywhere; collaboration internally and with the supply chain; ERP in the cloud; and more emphasis on end-to-end supply chain processes and systems. 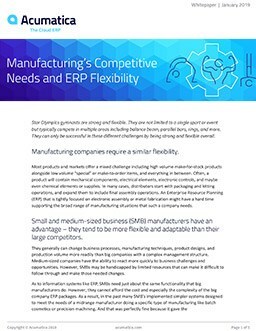 How will manufacturers conquer the demands for flexibility and collaboration without overlooking the operational excellence needed at the core of their businesses? Without a doubt, the top challenges for manufacturers – and their solutions – depend on visibility of timely, accurate information and collaboration within the company as well as with the supply chain. Information that is up-to-the-minute accurate. The ability to drill down into detail to understand what they see at the top. The ability to easily integrate data from multiple sources. Customizable presentations to focus on the specific information they need. In response, the industry is seeing a rapid movement towards self-service business intelligence. 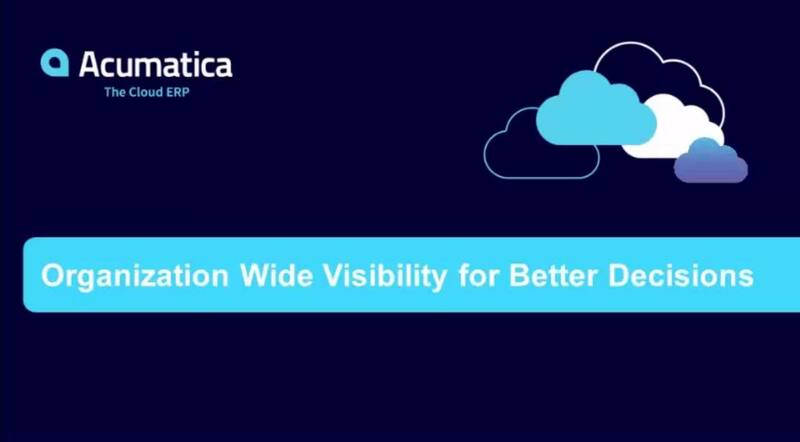 “Cloud deployments offer organizations more agility and flexibility when deploying analytics to meet shifting business needs. Self-service users with cloud analytics gain an additional level of freedom as they are able to access data from anywhere. ** The Unified Manufacturing Environment: Transparency, Collaboration, and Desion-Making with End-to-End ERP, Nick Castellina, Research Director, Business Planning and Execution, Aberdeen Group, April 2015. Page 3. Acumatica Manufacturing Edition is built on modern web technology to integrate information across applications and throughout the Acumatica system. All data updates are immediately available system-wide, so there is no delay in sharing vital information – and no need to re-key data in multiple places. The system’s document management and workflow facilities contribute to data accuracy by ensuring that important steps are completed properly and all approvals, documents, and other required data are included. Acumatica Manufacturing Edition also enhances your production planning and control. BI, embedded in Acumatica, monitors key metrics and delivers manufacturing reporting information through comprehensive business dashboards. Drill-down into summary and detailed information is immediately available for fast and accurate decision-support. The integrated content pack for Microsoft Power BI enables true self-service analytics – anyone can get rapid, actionable insights using natural language and simple drag-and-drop. Self-service users can proactively monitor key metrics, spot real-time trends, and get critical alerts from personalized dashboards. Acumatica mobile capabilities allow users to access information from anywhere, at any time, on any device that uses a common browser. With Acumatica’s manufacturing management software, collaboration exists both inside your business and with your supply chain. Because Acumatica allows unlimited users, there is no barrier to including supply chain partners – suppliers, outside processors, distributors, and even end-user customers – in your collaborative environment through portals to inquire, order, or simply communicate. 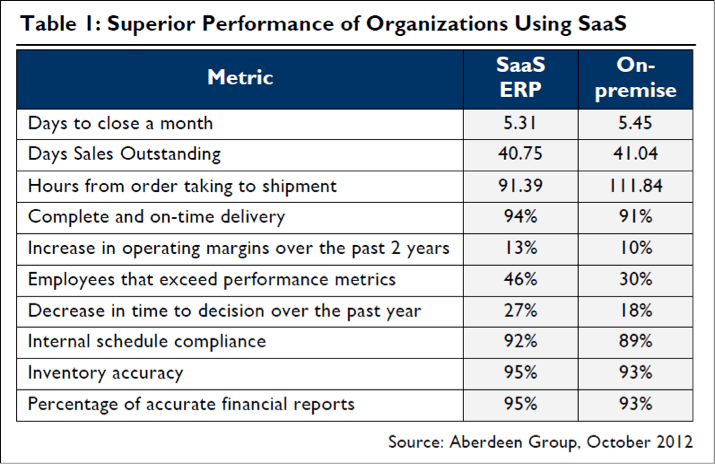 Another Aberdeen Group study, “The Case for Cloud ERP In Manufacturing: Alleviating Outdated Concerns”**** also found an advantage for manufacturers who choose SaaS ERP solutions. These organizations ship orders more effectively, make quicker decisions, have more accurate inventories and financial reports, and enable their employees to be more effective. …all other things equal, it appears cloud solutions produce an advantage.